You want to talk about being in the right place at the right time? Paul Cole, a retired salesman on Florida’s Treasure Coast, is in one of the most beloved, most reproduced and most iconic photographs of the past 35 years. Get out your copy of Abbey Road, the final Beatles album, and still the best-selling record of their illustrious career. You’ll see the four Beatles walking single-file on the crosswalk in front of their recording studio, which just happened to be on Abbey Road in north London. In the background, just behind John Lennon, is Paul Cole. The picture was taken on the morning of Aug. 8, 1969. 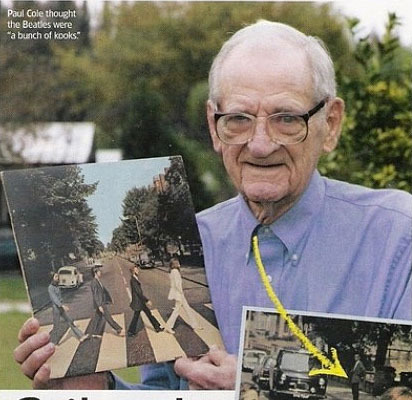 Photographer Iain McMillan brought the four Beatles outside, had them walk back and forth a few times, shot for 15 minutes and called it a day. The picture everybody liked found the Beatles stepping symmetrically. At that very moment, Cole – on vacation from Deerfield Beach – had opted out of entering a museum on Abbey Road with his wife. “I told her ‘I’ve seen enough museums. You go on in, take your time and look around and so on, and I’ll just stay out here and see what’s going on outside,'” says the 93–year-old Cole, who was in his 50s at the time. Parked just outside was a black police vehicle. “I like to just start talking with people,” Cole says. “I walked out, and that cop was sitting there in that police car. I just started carrying on a conversation with him. I was asking him about all kinds of things, about the city of London and the traffic control, things like that. Passing the time of day. In McMillan’s available alternate shots, all taken from the same spot (atop a stepladder in the middle of the street), there is no evidence of the police car or of Paul Cole. About a year later, Cole first noticed the Abbey Road album on top of the family record player (with Paul McCartney sans shoes). He did a double-take when he eyeballed McMillan’s photo. “I had a new sportcoat on, and I had just gotten new shell–rimmed glasses before I left,” he says. “I had to convince the kids that that was me for a while. I told them ‘Get the magnifying glass out, kids, and you’ll see it’s me.